If you're a fan of apothecary esque skincare products then you're going to absolutely love the L'Occitane Aromachologie range. 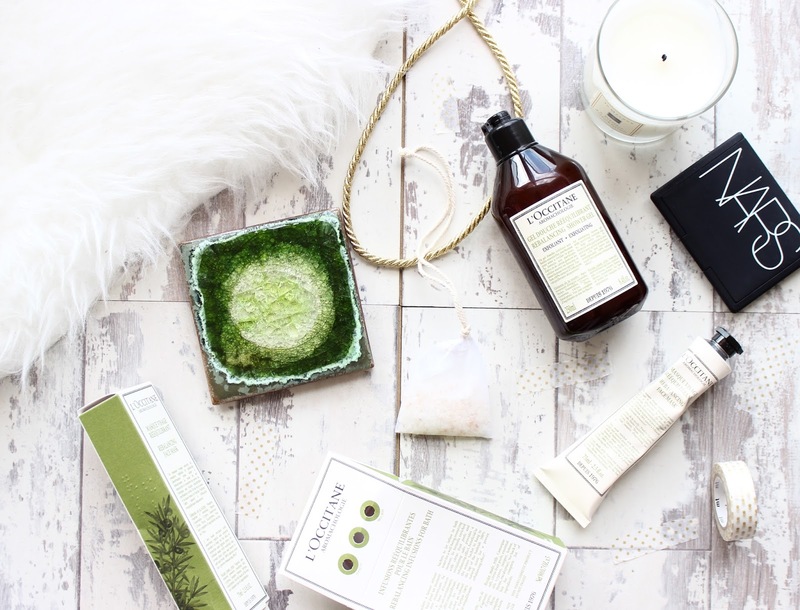 All the products aim to deliver an at home spa experience with top notch ingredients and insanely beautiful Pinterest worthy packaging. Starting with the most interesting product from the range, the Rebalancing Infusions for the Bath, which are essentially tea bags for your bath. I love bath salts and I love the idea of having individual sachets and treating your bath like a big mug of tea. The pack comes with 5 sachets, which all contain citrus fruit peal and revitalising salts, to rebalance both the body and senses. I love the scent of these as the citrus is quite unusual for a relaxing bath but I find they leave you feeling completely de-stressed. Next is the Exfoliating shower gel, which is another product that I think is quite novel. You will normally find either a shower gel or a body scrub, but not a product that does both. Firstly the bottle looks so stunning in the bathroom and very Aesop like. The shower gel contains 5 purifying essential oils to really nourish the skin- Cypress, Juniper, Lemon, Thyme and Eucalyptus and then Olive & Lemon particles to gently remove impurities leaving the skin silky soft. The dual action of the oils and the slight exfoliant leave your skin feeling nourished and baby soft. The last product I've been trying from the range is the Rebalancing Face Mask, which is a clay like mask to remove impurities and tighten pores. It's packed with essential oils to rejuvenate the skin and restore it's natural glow. This is great to use when you're not feeling great and it's showing in your skin. I like to use this on my T-Zone as I find clay masks are a little too harsh for my cheeks. I've heard so much about this brand! That face mask sounds delightful! My pores are so horrible at the moment, so something like the Rebalancing Face Mask sounds great!